EnviroPolitics Blog: Can lying lobbyist crook Jack Abramoff save America? Some folks (especially those benefiting most from our rigged system) express bewilderment about the basis for the public frustration that manifests itself in the Tea Party and the Occupy movement. Even among the dissatisfied, the exact reasons for our fears are sometimes elusive. We sense that the country we grew up in is sliding away. Things that used to work have become untrustworthy. The economy. The political system. Leaders. None of it inspires much hope. Who can we trust with an answer? 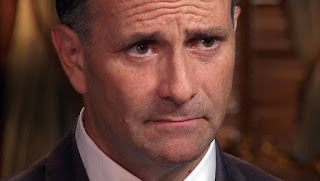 Maybe Jack Abramoff, the lying, lobbyist-crook-turned-penitent. Say all the bad things you want about Abramson. He deserves them all. But in an incredibly forthright interview on 60 Minutes last night, he shines a revelatory light on what's eating away at the core of our political system--the corrosive and corrupting influence of money. Abramson even offers one slight hope. Watch the interview to learn what it is and then let us know what you think in the opinion box below. Caution: The interview will make you sick. If it doesn't, it already may be too late for us all.